Draw a card and Counterfeit Trinket deals 1 damage to you. 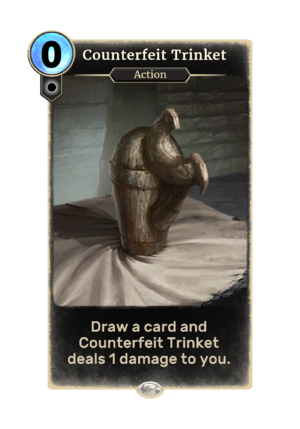 Counterfeit Trinket is a common Neutral action card. It is a card received when a Thieves Guild Shadowfoot is played, which swaps the opponent's deck's top card with this one. The card depicts one of the burial urns from Skyrim.